Geraniums often take a back seat to many of the other species of spring bedding plants. In the last twenty five years many hybrid seed geraniums have been introduced for the commercial market. Propagators and growers are reacting to changing consumer purchase patterns by offering a wide selection of geranium flower and foliage colors. Producing quality geraniums does not happen without attention to detail. The following information will explain a few of the common problems that occur in growing geraniums. In selecting a growing medium, physical and chemical properties of the soil are important. Growers often ignored these factors when using soilless mixes. Mineral soils and soilless mixes share many chemical and physical properties. In both cases these soils can be engineered and made desirable for geranium production. The fact remains, soilless mixes offer more flexibility and give the grower a greater margin of error in controlling both the physical and chemical properties of the medium. A very important physical property of the growing media -- porosity -- influences gas exchange and water availability. Good porosity eases water management and increases the flexibility needed to control moisture levels while extending the schedule of fertilizer applications. If the roots are to develop and take up water and nutrients, they must take in oxygen while giving off carbon dioxide and respiration products. These gases must diffuse in and out of the soil. Gas diffusion is much faster through air than through water. For greater air-filled pore space, coarse particles must be present in the soil. Porosity is influenced by the growth medium's particle size and distribution. In general, soilless mixes have proven excellent for growing geraniums. Before switching to a new mix, you should experiment on a small scale before making a complete change. Different mixes do require different management. It takes most people some time to learn how to handle watering the different soilless mixes. The light weight and rapid drying of some soilless mixes can be a problem with geraniums and depends on growing conditions in the greenhouse. To maximize growth, the fertilization of geraniums during production is extremely important, and an understanding of complete nutrient management is essential if fertilizer problems are to be avoided. Many growers use a constant fertilization with a water soluble fertilizer. Although this is an excellent fertilization method, it is very important that adequate water be applied so that a sufficient amount of water drains or drips through the medium at each watering. A buildup of fertilizer salts will occur in the medium when watering is not thorough. In many instances the total fertilizer content (soluble salts) of the medium will become so high that plant growth will be severely checked. The recommendation for constant feed fertilizing of geraniums is generally 200 to 250 ppm of nitrogen. Experience suggests nutrient problems are minimized when a constant fertilizer program is used. Fertilizer types: 15-15-15 (Geranium Special), 15-16-17 Peat-lite, and 20-10-20 Peat-lite. EXCEL Cal-Mag 15-5-15 could be used as a supplement limestone to add Ca and Mg. Fertilizer rates and strategy: 200-250 ppm N constant liquid feed or 150-200 ppm N with subirrigation or another restricted leaching system. Begin fertilizing at planting. Monitor salts and pH. Remove saucers from ivy geranium baskets to allow adequate drainage. All geranium types are intolerant of high soluble salts. Zonals and "floribundas" are susceptible to iron (Fe)/manganese (Mn) toxicity. The higher pH range for zonals and floribundas reduces the availability of excess Fe and Mn. Ivies often show interveinal chlorosis due to Fe or magnesium (Mg) deficiency. Mg occurs on the lower leaves first; Fe deficiency generally occurs on the youngest leaves first. Boron (B) deficiency was a major problem for zonal geraniums in the past, but it seems to be rare today. Upper leaves become chlorotic and show necrotic lesions on the undersides. The leaves easily fall off with slight pressure. Probably the common practice of using water-soluble fertilizers containing trace elements has greatly reduced the occurrence of this problem. Some cultivars of ivy geraniums are susceptible to a physiological condition called oedema (or edema). Symptoms appear as bumps or blisters initially on the undersides of lower or older leaves on a plant. They may then turn brownish or tan and become corky. Severely affected leaves will often turn yellow and fall off the plant. Up until recently, oedema has been thought to be caused by too much water, high humidity and/or poor drainage. Low N, P, Mg, and Fe; pH above 6; and/or high EC was also linked to the problem as well. Recent research indicates that selecting ivy geranium cultivars that are resistant to oedema offers the best option at this time for growers to manage it. Optimal pH ranges: zonals - 5.8-6.5, ivies - 5.3-6.0, "floribundas" 6.2-6.5. The pH scale indicates acid and basic values in the growing medium. The pH level of 7, midpoint in the scale from 0-14, is neutral and the values below this point are acidic and those above are basic. Geraniums are influenced by the growing medium's pH. It is believed that many hybrid geraniums will not flower well at a pH below 5.5. At a pH below 5.8, zonals and floribunda geraniums are susceptible to iron and manganese toxicity which exhibits as brown spots beginning along the edges of the leaves. The effect of temperature on the growth and development of geraniums can be dramatic. Temperature influences the rate of photosynthesis and respiration, processes of floral initiation and development, the length of time to maturity, final plant quality, and ultimate post production life. While geraniums can be produced over a wide range of temperatures (45 to 80 degrees F), they respond best when treated as a warm temperature crop. For the production of geraniums using the "Fast Cropping" technique, night temperatures of 60 to 65 degrees F and day temperatures of 70 to 75 degrees F are best for optimum plant growth. When the temperature is lowered below 60 degrees F, growth begins to slow. At a night temperature of 55 degrees F growth is slow and plants will flower later. At 50 degrees F, growth almost stops and maturity can be delayed substantially. If plants are exposed to temperatures of 50 degrees F or lower for more than 12 hours, they will often develop reddish color in the older leaves. Mean daily temperatures above 80 degrees F or day temperatures exceeding 85 degrees F for 12 hours or more can cause a loss of chlorophyll (heat stress) in the youngest leaves and cause a sharp decrease in plant growth and development. There is considerable variation in the response of geranium cultivars to low and high temperatures. While some cultivars may exhibit heat or low temperature stress, other cultivars grown under the same conditions in the same greenhouse may show no signs of stress. Watering greenhouse floriculture crops remains the most difficult task to perfect. Many factors such as type of crop, pot size, temperature, soil mix, bench design, and type of heat can effect watering practices. The decision relating to when to water is still an "art" rather than a "science". Surprisingly, there is little information on plant water needs. The last few years, researchers have been studying the water needs of annuals and perennials. Criteria such as touching or looking at the medium (when the medium surface lightens in color) or foliage color (shiny - no need to water; dull - need to water) or when the pots feel light in weight have been used for years. Unfortunately, most floriculture crops are watered when the grower notices the leaves are wilting. When the leaves of a plant wilt, the plant has already undergone a water stress which results in a decrease of the growth rate. This is especially true with geraniums which are slow to wilt, even when the plants are under a water stress. 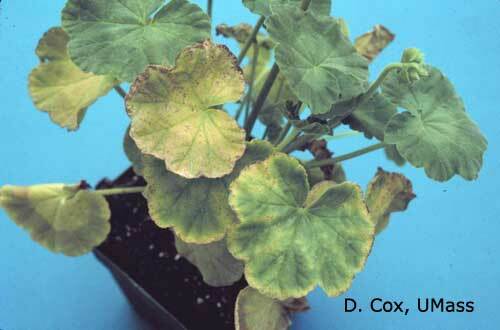 Subjecting geraniums to water stress is sometimes used as a growth regulator. However, it is not generally recommended to regulate geranium growth in this way. Additionally, allowing a soilless mix to dry out makes it difficult to rewet unless a wetting agent is added to the medium or irrigation water. Every time a medium is irrigated it is recommended that a sufficient amount of water be applied to avoid water stress, allow adequate moisture for plant growth. Traditionally the recommendation has been to water until about 10-15% of the volume applied drains from the pot to avoid excess soluble salts. In today's terminology this is described as a 0.1-0.15 "leaching fraction" (LF). Most growers probably greatly exceed this LF; probably LFs of 0.4-0.6 are more common. For best management practices, the goal is to achieve a LF of zero, but for many getting the LF down to the recommended range of 0.1-0.15 would be a big step in reducing greenhouse runoff. The best way to limit excessive leaching is by the use of a carefully-controlled spaghetti-tube irrigation system with drip emitters. Irrigation solution should be applied slowly and in small volumes for the best results. Also, researchers have found that "pulse irrigation" - brief periods of fertigation - is best for efficient application of water and nutrients. Achieving 0 LF with a hose is probably impossible, but reducing LF is possible if the waterer takes the time to observe how much water is applied or how much time passes before leaching begins as each pot is watered. It is important to remember that any significant reduction in LF should be accompanied by a reduction in fertilizer rate (ppm) and/or frequency of application. If LF is reduced or there is no leaching, more fertilizer will stay in the pot and soluble salts could increase to a harmful level. Therefore, fertilizer rate should be cut at least 25%. Also it is very important that soluble salts be monitored more frequently when leaching is stopped or cut back. The best time to water is in the morning when the temperature is increasing so that foliage dries as quickly as possible. Many growers use an automated watering system, such as spahetti-tube irrigation or subirrigation such as ebb-and-flow, when plants are placed at final spacing. Some cultivars are not as free-branching as others, so they will not produce as many flowers stalks. The use of ethephon (Florel) to increase branching is a common practice. Florel applied at a rate of 350 to 500 ppm, 4 to 6 weeks prior to sale, is recommended. When Florel is applied late in the production cycle, flower buds will continue to abort after the plants are sold. Note: treated plants will have smaller leaves, and internodes will be shorter. Production schedules will vary depending on the desired finish size of geranium and sale date. Geraniums were historically sold for Memorial day in 4-inch pots. Today, depending on weather and geographic region, sales may begin in early May and continue through June. Although 4 to 4.5 inch size is popular, pot sizes may range from 3-inch to 6.5-inch or larger. There are several decisions to make when considering scheduling. Will you grow stock plants for cuttings and propagate plants? Will you purchase unrooted cutting? Will you purchase calloused cuttings? Will you purchase rooted cuttings? Below are sample schedule guidelines or contact your supplier. March 11 April 8 Pinch cutting allowing three nodes to remain if roots are at sides and bottom of pot. Note: Cycocel may cause some foliar yellowing on younger leaves. Plants usually recover in a few weeks. Photo: Cycocel injury on seed geraniums. Geraniums IV, John White, Ball Publishing, 1993. Tips On Growing Zonal Geraniums, Ohio Cooperative Extension Service, The Ohio State University, 1988.